About four years ago I made a quilt for my desk and it sits above my computer where I look at it every day. The lighting is bad (well, isn't it always in an office building) and the photo was taken with my new iPhone, so it's not the best. It gives me something bright and cheery to look at every day instead of the drab taupe walls and the cream colored walls. I love color too much to go without some bright colors in my desk. This was actually the second quilt I made with this pattern. The first one I made in a class to learn about stained glass quilting. I did not do a very good job with alternating the value of colors in the first quilt and it looks very flat. 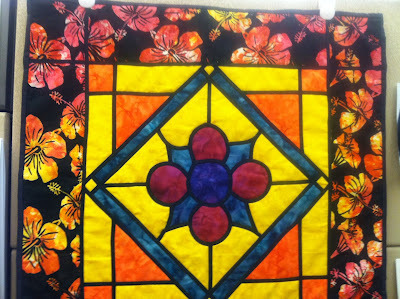 I used the same fabrics, except for the boarder, in the second quilt and it works much better in terms of value, but it still could use some variety, especially in the flower and leaves section of the quilt. If I could re-make this quilt after more years of experience I would change things up even more. Phew, it seems like it's been forever since I last sat down in front of my sewing machine. Maybe that's because it's been since the end of March! YIKES!!! I just returned from Las Vegas last week from my company's major trade show which was consuming a bit of my time. Now that it's behind me, I can really get back into the swing of things. First things first, I must clean up my quilting room. It's an absolute mess!!! I can't get motivated to do ANYTHING until I get this room cleaned up. After that, finish quilting the last row of blocks on my Eva quilt.I've got the first four rows done, I just need to finish the fifth. Once done with that I can get back to working on some of my other projects including the Storm at Sea quilt for my parents, the multiple BOMs that I need to finish, and more. I hope to have more fun posts to come with some action in my quilting. It seems like forever. I miss it.